This topic describes the elements that display the visual content of the report. Many of these elements can be a child of <pageheader> <pagefooter>, <pagestartsidebar>, <pageendsidebar>, <body>, <block>, <div>, <group>, or <table>. <barcode>  Adds a barcode to the generated PDF. Not supported for HTML. <barcodeOptions>  Adds options to a <barcode>. <bidioverride>  Adds an <fo:bidi-override> element to the generated XSL-FO, and a <bdo> element to generated HTML. <inlinecontainer>  Adds an <fo:inline-container> element to the generated XSL-FO. <small-multiple>  Series of graphic elements repeated on the page. In addition, Zen reports supports a number of elements that let you create charts. Zen reports callback charts replicate the charting capability provided by charts in Zen pages. The section Zen Charts in the chapter Using Zen Components describes all the types of charts supported by both Zen pages and Zen reports. The section Zen Reports Callback Charts in this book discusses topics specific to charts in Zen reports. Each of the display elements listed in this chapter has the attributes described in the following table. It may have other attributes also. CSS style class to apply to the element. Style classes can be defined by the <class> element in addition to those given by the standard style sheet. For more information, see the discussion following this table. htmlstyle Same as the style attribute described in this table, but the styles specified using the htmlstyle attribute apply to HTML output only. Comma-separated list of ObjectScript expressions. At runtime, the Zen report evaluates the selectstylecond expressions from left to right. The style in selectstylelist that corresponds to the first true condition in selectstylecond is applied to the display element. For details, see Conditionally Applying CSS Styles following this table. Comma-separated list of CSS statements to use with selectstylecond. If you apply a style to a container such as <block>, it might not apply to every node within the container. If you have difficulty with this, try applying the style attribute to the lower-level node, such as <item>. The name of an <xsl:template> to execute. The template must be defined in an XData HtmlXslt or XData XslFoXslt block (or both) in the same Zen report class. Semicolon-separated list of names of <xsl:param> arguments for an <xsl:template> to invoke for this <item>. Semicolon-separated list of expressions that provide values for the <xsl:param> arguments defined for an <xsl:template> to invoke for this <item>. These expressions can be literal values, node sets, XPath expressions, or XSLT function calls. Anything that is valid as a value for <xsl:with-param> in XSLT is valid in styleparams. templateClass is the name of the subclass of %ZEN.Report.Display.reportTemplate that defines the template. templateName is the name of the specific XData block within the templateClass that provides the template for this element. If the template name starts with exclamation point (!) it is interpreted as a COS runtime expression. HTML length value that defines the element’s width. The exact meaning depends on the individual element. If widths are omitted, the PDF rendering tool can produce unexpected results. "2in", "5cm", "12px", "14pt", "3em", or "75%" are all valid formats for HTML length values. A percentage is relative to the container for the element that uses the width attribute. xslfostyle Same as the style attribute described in this table, but the styles specified using the xslfostyle attribute apply to the XSLFO stylesheet for PDF output only. Parent elements propagate their class attribute values to children that do not have a class specified. So if you define table.myTable, th.myTable, and td.myTable, you only need to give the <table> element a class attribute. You can even put a class attribute on the <body> element to give a class for every element in the report (at least, for those that do not override it with a class attribute of their own). The simplest style attribute for a display element is style. This provides a semicolon-delimited list of CSS styles to apply to the display element. It is possible for a display element to define a list of conditions to define a list of styles. The selectstylecond attribute is a comma-separated list of ObjectScript expressions. These expressions may not contain private variables, but you may use the special variable %report to indicate the report class, and dot syntax with %report to reference properties of the Zen report class. At runtime, the Zen report evaluates the selectstylecond expressions from left to right. The style in selectstylelist that corresponds to the first true condition in selectstylecond is applied to the display element. A comma (,) separates list entries in the Zen report selectstylelist list. Each selectstylelist entry may consist of a list of CSS style definitions. A semicolon (;) separates entries in the list of CSS style definitions within the same Zen report selectstylelist list. Each entry consists of a CSS style name and its value. A colon (:) separates each CSS style name from its value. Information contained within any style attribute takes precedence over style information given by the class. If you use %report in aselectstylelist list in a way that relies on a property value passed as a ZENURL in the URI that invokes the report, you may see unexpected results if XSLT processing takes place in the browser. See the section Setting Zen Report Class Properties from the URI for more information on this issue. Zen reports supports generation of barcodes with Barcode4J. Barcode support is provided by the FOP rendering engine provided with Caché which has the file barcode4j-fop-ext-complete.jar installed. Zen reports does not support barcode rendering for HTML or the RenderX PDF rendering engine. Display attributes For descriptions of style, width, class, and other attributes, see the Report Display Attributes section at the beginning of this chapter. The namespace prefix for BarCode4J barcode elements in the namespace http://barcode4j.krysalis.org/ns. Specifies the orientation of the printed barcode. Possible values are: 0, 90, -90, 180, -180, 270, and -270. The default value is 0. The type of this barcode. See http://barcode4j.sourceforge.net/2.1/barcode-xml.html for information about barcode types. An XPath expression that provides the information rendered in the barcode. If null, value can provide the barcode message. A text message you can use in HTML output as a place holder for barcodes. The initial value is: "Barcode elements are only supported in PDF output." The information rendered in the barcode, used only if field is null. Specifies whether the barcode uses XML escaping. If <barcodeOptions> is true, the <barcodeOptions> content is enclosed in CDATA syntax; if false it is not. See the Barcode4j documentation at sourceforge.net for information on filling out <barcodeOptions> for a specific barcodeType. <block> has the following attributes. The <bidioverride> element adds an <fo:bidi-override> element to the generated XSL-FO. It is used to override the direction of text as determined by the Unicode Bidirectional Algorithm, to correctly render text for different scripts in mixed-language documents. Practical uses for <bidioverride> include cases where text includes text written in a different direction, and rendering of European numbers in Hebrew or Arabic text. Note that an <fo:bidi-override> cannot contain an <fo:block>, hence the use of <inline>. The appendix Generated XSL-FO and HTML lists which Zen reports elements generate block and inline XSL-FO output. bidi-override For inline elements this creates an override. For block container elements this creates an override for inline-level descendants not within another block container element. This means that inside the element, reordering is strictly in sequence according to the direction property; the implicit part of the bidirectional algorithm is ignored. This corresponds to adding a LRO (U+202D; for 'direction: ltr') or RLO (U+202E; for 'direction: rtl') at the start of the element or at the start of each anonymous child block box, if any, and a PDF (U+202C) at the end of the element. embed If the element is inline, this value opens an additional level of embedding with respect to the Unicode Bidirectional Algorithm. The direction of this embedding level is given by the direction property. Inside the element, reordering is done implicitly. normal The element does not open an additional level of embedding with respect to the Unicode Bidirectional Algorithm. For inline elements, implicit reordering works across element boundaries. The <br/> element inserts a line break within the current element. The correct syntax for this element is XHTML syntax, which makes the element into valid XML by placing a slash character before the closing angle bracket. The <container> element provides a container for other content. The <container> can have a background image assigned to it; this image is displayed as a tiled background for the contents of the <container>. You can provide multiple <container> elements on a page, and you can nest <container> elements. <container> elements are useful if you want to create a report that looks like a pre-printed form, with text layered over images that represents fields on the form. You can also use a <container> to provide a watermark such as CONFIDENTIAL or DRAFT for the entire report page. The following example outputs a <list> that contains one line for each person found in the imagetest group. Each output line contains the value of the Name of each person. In this example, the <container> creates a background for the <list> output by tiling the barchartblue.png image behind the list in the report. By default, Zen tiles the background image across the width and height of the container area, starting at the top left corner and tiling from left to right and top to bottom as permitted by the relative sizes of the image and the container area. You can change the image repeat and positioning style for XHTML and PDF output by applying the Report Display Attributes style, htmlstyle and xslfostyle to the <container>, as in the following example. Note this example also shows a convention of using nested containers on the same report page. In this example, line breaks have been added within attribute values to avoid truncating the code on the documentation page; these line breaks would not be present in working code. The Zen report class looks for the file myPic.png in the subdirectory /csp/mynamespace/images below the Caché installation directory. If the backgroundImage attribute value begins with an exclamation point, it is interpreted as an XPath expression just as in the field attribute of the <item> element. This allows you to dynamically generate URIs within the XML data, and then use these customized URIs as the image source. When using ! (exclamation point) to dynamically generate the image URI, the resulting string must be an absolute URI or it does not appear in the PDF report. Note that the built-in FOP may have problems rendering image files in .jpg format. To avoid problems, use files in .png format. (Optional) Caption text for this container. height HTML length value that specifies the area in which to display the container in the report. By default, the container contents fill this area. width HTML length value that specifies the container width. By default, the container contents fill this area. Adds the writing-mode attribute to the <fo:page-sequence> element in the generated XSL-FO. writing-modecontrols aspects of page layout relevant to the direction in which text is written. See the section Writing Mode for a detailed discussion of thewriting-mode attribute. The following example defines border styles so that a table is contained in a black bordered box. <div> can be used within tables to define bordered areas containing tables within tables. <div> has the following attributes. See the discussion following this table for more details. You cannot use breakOnLineFeed="true" in conjunction with linefeed-treatment="preserve". Within an XData ReportDisplay block, the <group> element allows the Zen report class to respond to the hierarchically structured data that is typical of XML. There is a different <group> element for use within an XData ReportDefinition block. <group> has the following attributes in XData ReportDisplay. An XPath expression that provides a condition used to determine whether to add a page break to the report. (Optional) Caption text for this group. HTML length value that specifies the thickness of the line to be drawn between each iteration of the group. If line is 0, no line is drawn. Required. XPath expression that identifies the group, within the XML data source, that supplies the data for this part of the display. To display a group as a table, see the group attribute of <table>. If true, put a page break after each iteration of the group. If true, put a page break before each iteration of the group. If true, identifies the group that is processing the primary group set by the primaryGroup attribute of <report>. Not specified, the <group> inherits the removeEmpty value of its parent. If no element in the ancestry of this <group> specifies a removeEmpty value, then the default is 0. 0, empty element and attribute values are output to the XHTML or PDF generated for this <group> in the report. 1, empty element and attribute values are not output to the XHTML or PDF generated for this <group> in the report. "none"  Items in the group have no visible separator between them. This is the default if no separator is specified. "line"  A thin horizontal line separates items in the group. "false"  Items in the group are not output as small multiples. This is the default if small-multiple is not specified. "true"  Items in the group are output as small multiples. See <small-multiple>. The name of the small multiple. Use with small-multiple. An XPath that provides a condition that is applied to each element of the group to determine whether the element is included in the report. Used when you are not using a primaryGroup. The <header> and <footer> elements are simple containers. Their primary purpose is to help organize the propagation of styles within the report. Each of the <header> and <footer> elements can propagate its class attribute value to its children. <header> and <footer> each support the attributes listed in the following table. This attribute does not apply to output in XHTML format. The <img> element inserts an image into the report. <img> has the following attributes. (Optional) Caption text for this image. HTML length value that specifies the actual height of the image. For PDF output, the contentHeight may be different from the height specified for the area in which to display the image in the report. There is more information about providing images as streams following this table. contentWidth HTML length value that specifies the actual width of the image. For PDF output, the contentWidth may be different from the width specified for the area in which to display the image. height HTML length value that specifies the area in which to display the image in the report. By default, the image contents fill this area. If the src attribute value begins with an exclamation point, it is interpreted as an XPath expression just as in the field attribute of the <item> element. This allows you to dynamically generate URIs within the XML data, and then use these customized URIs as the image source. When using ! (exclamation point) to dynamically generate the image URI, the resulting string must be an absolute URI or it does not appear in the PDF report. width HTML length value that specifies the image width. By default, the image contents fill this area. You cannot arbitrarily nest an <inline> element inside another element. There are display elements that can have children, and display elements that can only contain text. <inline> can appear as a child of <pageheader> <pagefooter>, <pagestartsidebar>, <pageendsidebar>, <body>, <block>, <group>, or <bidioverride> only. <inline> cannot appear as a child of content elements such as <link>, <inline>, <p>, or <write>. <inline> has the following attributes. Of these, the style attribute is the most significant for <inline>. Sets the bi-directional override direction for the inline text. Possible values are: "rtl and ltr". The default is ltr". Also supported by <p>. For descriptions of style, width, class, and other attributes, see the Report Display Attributes section at the beginning of this chapter. id Optional identifier. You can use the id to access the <inline> element to change its contents programmatically. For details, see the discussion of the content property following this table. Supports the XSL-FO property linefeed-treatment. See the discussion at the end of the section <div> for more details. The <inline> element is an XML projection of the Zen reports class %ZEN.Report.Display.inline. If you view the description of this class in the online Class Reference Information, you see that it has a property called content. 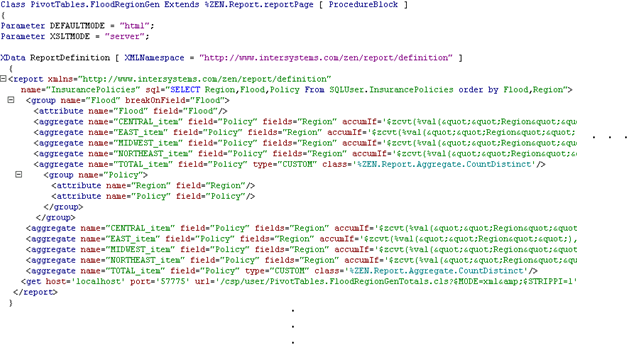 This is where Zen stores the text that you place in between the <inline> and </inline> elements in XData ReportDisplay. If you have a reason to programmatically change the text of an <inline> element on the server side before displaying a report, call the class method %GetComponentById(id) to retrieve a pointer to the %ZEN.Report.Display.inline object. Then you can access the content property of this object to change it as needed. The <inlinecontainer> element adds an <fo:inline-container> element to the generated XSL-FO. It can contain an attribute that overrides the writing-mode currently in effect. It must contain <fo:block> elements even though it represents an <inline> element. The appendix Generated XSL-FO and HTML lists which Zen reports elements generate block and inline XSL-FO output. Adds the writing-mode attribute to the <fo:page-sequence> element in the generated XSL. writing-modecontrols aspects of page layout relevant to the direction in which text is written. See the section Writing Mode for a detailed discussion of thewriting-mode attribute. Attributes for cross tab tables For descriptions of the attributes used to create this specialized type of table, see Creating Type 2 Cross Tab Tables. appendToZenLastPage In order to calculate a total page count, Zen reports generates a last-page marker. A report that has multiple, independently numbered sections, effectively has more than one ‘last’ page. When you use the attribute special to include page numbers, you need to use this attribute to provide a value that generates a unique last-page marker for the section that contains the item. Use it in conjunction with the <body> attribute appendIdToZenLastPage. The value must match the value of id supplied for appendIdToZenLastPage. See the section Page Numbering in Multi-section Reports for more information on using the appendToZenLastPage attribute. breakOnLineFeed If breakOnLineFeed is true, any line feeds that Zen encounters in element data are rendered as visible line breaks in PDF output. Line feeds are not preserved or supported within attribute values, only within the text contents of XML elements. 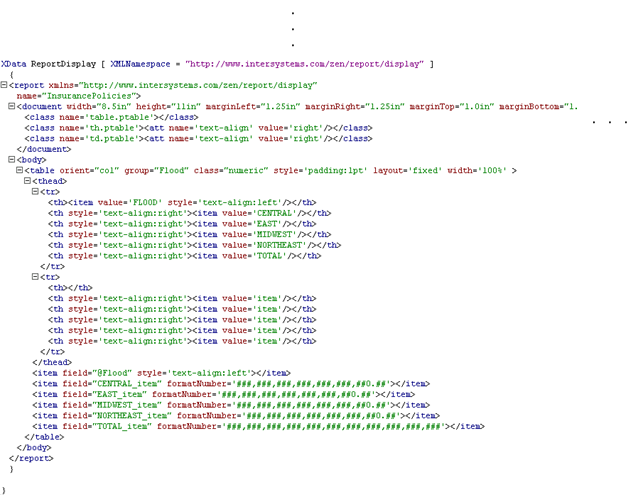 If breakOnLineFeed is false, line feeds are treated as white space and ignored, as is typical for XML processing. The default breakOnLineFeed value is false. copyxml If true, the field value of this <item> is interpreted as an XPath to be input to an <xsl:copy-of> operation; if false, the field value is interpreted as an XPath to be input to an <xsl:value-of> operation. displayCaption If true, prefix the caption text to the item output. For additional details see <caption>. If the field attribute is specified, the <item> renders the value of that field in the XML data. See the section field for more information. fieldname When a table uses sql or a queryClass and queryName to gather data, an item in the table can use the fieldname attribute to specify a data field in thesql attribute or query by name. See the sections Creating Tables from Class Queries and Creating Tables with SQL. fieldnum When a table uses sql or a queryClass and queryName to gather data, an item in the table can use the fieldnum attribute to specify a data field in thesql attribute or query by number. Also used to identify fields in the data returned to a table by a callback method. See the section Creating Tables with a Callback Method.. When insert-zero-width-spaces is true, Zen places an invisible, zero-length space after every other character in the contents of an <item>, except for the last character. This allows the FOP and XEP rendering engines to find these spaces and use them to wrap the data inside the display column. Without this setting, the default behavior is to allow the text to run over to the next column (FOP) or condense the characters in the data to fit the space (XEP). Either default can result in illegible text. linefeed-treatment Supports the XSL-FO property linefeed-treatment. See the section <div> for more details. Optional hyperlink to place around the item’s data. If the link attribute begins with an exclamation point, it is interpreted as an XPath expression just as in the field attribute. This allows you to dynamically generate URIs within the XML data, and then use these customized URIs in the display. Note that you cannot enclose string arguments to concat and other XPath functions, in single quotes. You need to use double quotes or the &quot entity. If link is specified, the item’s style class uses the "a" option. literalSpaces If true, this attribute causes literal spaces to display as spaces rather than being skipped. To do the same for line feed characters, set breakOnLineFeed to true. If the special attribute is specified, the <item> renders a predefined piece of dynamic data. For more information see the section special. Controls whether to display duplicate values that appear in sequence in a table. For more information see the section suppressDuplicates. suppressEmpty suppressEmpty offers an alternative to removeEmpty. removeEmpty is an attribute that you can apply to a <table>, <group>, or <report>. When true, removeEmpty actually removes empty items from the output. This can misalign the data set. Depending on the application, this can have fatal or disastrous effects. Where this poses a problem, you can use the suppressEmpty attribute on individual <item> elements. suppressEmpty displays a blank placeholder in place of any empty <item> so that positioning is not disturbed. suppressEmpty applies only to the individual <item> on which it appears. The following attributes are used when generating Excel spreadsheet output in displayxlsx mode. excelFormula Specifies that this aggregate should be an Excel formula in the generated spreadsheet. The value must be the name of the Excel formula equivalent to the type of the aggregate. This attribute is used only when generating an Excel spreadsheet in displayxlsx mode. See <element> for information on how excelFormula is used in the ReportDefinition. excelName Provides the column name for Excel output. This attribute is used only when generating an Excel spreadsheet in displayxlsx mode. See <element> for information on how excelName is used in the ReportDefinition. excelNumberFormat Provides a string that tells Excel how to format the number. This attribute is used only when generating an Excel spreadsheet in displayxlsx mode. See <element> for information on how excelNumberFormat is used in the ReportDefinition. isExcelAggregate Indicates that this item generates an Excel aggregate. The AGGREGATETAG parameter must be set in the report for the aggregate to appear in the Excel output. This attribute is used only when generating an Excel spreadsheet in displayxlsx mode. By default, the value supplied by an <item> is interpreted as text in the generated Excel spreadsheet. If you set the attribute isExcelNumber="true", the value is interpreted as a number in Excel. If Excel cannot interpret the value as a number, you see an error when Excel tries to open the generated spreadsheet. This attribute is used only when generating an Excel spreadsheet in displayxlsx mode. See <element> for information on how isExcelNumber is used in the ReportDefinition. The field attribute is interpreted with respect to the current <group> matched. For an <item> within <group name="SalesRep">, only <SalesRep> attributes and children of <SalesRep> are available. number  gives the record number within the group. page-number  inserts the page number within a PDF report. Is rendered as '##' in XHTML. page-count  inserts the number of pages within a PDF report. It is rendered as '##' in XHTML. page-number-of  inserts the page number in the form '2 of 18'. It is rendered as '## of ##' in XHTML. page-number-/  inserts the page number in the form '2/18'. It is rendered as '##/##' in XHTML. The last three values of special allow you to generate the last page marker id dynamically based on an XPath value defined in the field attribute of the <item>. You need to generate the last page marker dymanically when you have set the <body> attribute genLastPageIdOn. page-count-with-xpath  inserts the number of pages within a PDF report. It is rendered as '##' in XHTML. page-number-of-with-xpath  inserts the page number in the form '2 of 18'. It is rendered as '## of ##' in XHTML. page-number-/-with-xpath  inserts the page number in the form '2/18'. It is rendered as '##/##' in XHTML. See the section Page Numbering in Multi-section Reports for more information on using the special attribute. The attribute ofString specifies the string used between numbers in the page numbering format '2 of 18'. The default value is  of . In order to calculate a total page count, Zen reports generates a last-page marker. In a report with multiple independently-numbered sections, each section has a last page, so for the purposes of page numbering, there are multiple last pages in the report. When the report <body> element has appendIdToZenLastPage set to true, the report appends the <body> element’s id value to the last page marker for the section in order to generate a unique last-page marker. When you use the <item> attribute special to add page numbers and page counts, you use appendToZenLastPage to identify the last page marker for the section that contains the item. Therefore, the value supplied in appendToZenLastPage must match the id value of the <body> element of the section. The <line> element inserts a line break between elements in the report. This can either be a visible horizontal line or an empty line break. <line> has the following attributes. align Alignment within the report page. Possible values are "left", "right", and "center". (Optional) Caption text for this line. count The number of line breaks to draw. This is the same as repeating the <line> element. HTML length value that specifies the line length. length only applies to solid or dashed lines. HTML length value that specifies how much vertical space to reserve for displaying the line. This is not the same as the line thickness when the pattern is "solid" or "dashed". lineHeight applies to "empty" lines as well. Despite using this attribute, line spacing can vary between XHTML and XSL-FO (that is, PDF). This can be overcome using <fo> and <html> elements. pattern Possible values are "empty", "solid", and "dashed". thickness HTML length value that specifies the line thickness. The default value is 1px. thickness only applies to solid or dashed lines. The <link> element allows a user to click on a link to display the online resource identified by the <link> destination value. To provide a link caption, enter text between the <link> and </link> elements in the report. Use of the XSLT function concat() to compose the URI from text snippets and data values. Passing XPath expressions as the values for ZENURL parameters FACILITY and PATID in the target report class. Note that you cannot enclose string arguments to concat and other XPath functions, in single quotes. You need to use double quotes or the &quot entity. Also note the somewhat unusual-looking string &amp;amp;, which is required pass an ampersand character through to the URI in the browser. The first ampersand entity, &amp;, is converted to an ampersand during Zen reports XData block processing. That ampersand and the following amp; combine to form an ampersand entity in the generated HTML which is then rendered as & by the browser. <link> has the following attributes. destination An XPath expression that provides the URI for the link destination. id Optional identifier. You can use the id to access the <link> element to change its contents programmatically. For details, see the discussion of the content property following this table. If true, the link destination is the id of an element on the current page. In HTML output an internal value of true prepends the link with a # character; in XSL-FO output it assigns the internal-destination attribute to the link. If the internal attribute is false, blank, or not supplied, the link destination is assumed to be the URI of another page. name Provides a name attribute value for the link, to be used in HTML output only. The <link> element is an XML projection of the Zen report class %ZEN.Report.Display.link. If you view the description of this class in the online Class Reference Information, you see that it has a property called content. This is where Zen stores the text that you place in between the <link> and </link> elements in XData ReportDisplay. If you have a reason to programmatically change the text of a <link> element on the server side before displaying a report, call the class method %GetComponentById(id) to retrieve a pointer to the %ZEN.Report.Display.link object. Then you can access the content property of this object to change it as needed. <list> has the following attributes. Display attributes For descriptions of style, width, class, and other attributes, see the Report Display Attributes section at the beginning of this chapter. For a <list> element, the style attribute applies to its bullets or numbers. Required. If no group is specified for a <list>, there is only one item in the list. Since you want multiple items in a list, it makes sense to specify a group attribute for each <list>. Within the list you must provide one or more elements such as an <item> to identify which data from the group needs to be displayed in the list. At first glance, it appears that the rule is that the group value for a <list> in XData ReportDisplay must match the name value for a high-level <group> or <report> defined in XData ReportDefinition. Many times this is superficially true. However, this convention is more interesting than it seems. The value of the group attribute is a partial XPath expression that continues the implicit XPath expression that began with the containing <report> or <group> for the <list>. That is, group and field expressions concatenate downwards from other group and field expressions that are specified above them in the hierarchy of the <report>. Knowing this allows you to use groups and lists in more interesting ways. image The URI of an image to use as a custom bullet. If you provide an image value, the type attribute is ignored. "none"  Items in the list have no visible separator between them. This is the default if no separator is specified. "line"  A thin horizontal line separates items in the list. startvalue The first number value for ordered lists. startvalue is always specified as an integer. If type is "A" and startvalue is "3", the first element in the list is labeled "C". type The bullet or numbering style to use for list items. Possible values are: "none", "circle", "square", "disc", "1", "A", "a", "I", "i". PDF reports do not support "square" or "circle". The <p> element renders a block of text. It uses the "p" option for its style class. <p> has the following attributes. Sets the bi-directional override direction for text in the paragraph. Possible values are: "rtland ltr". The default is ltr". Also supported by <inline>. id Optional identifier. You can use the id to access the <p> element to change its contents programmatically. For details, see the discussion of the content property following this table. The <p> element is an XML projection of the Zen reports class %ZEN.Report.Display.p. If you view the description of this class in the online Class Reference Information, you see that it has a property called content. This is where Zen stores the text that you place in between the <p> and </p> elements in XData ReportDisplay. If you have a reason to programmatically change the text of a paragraph on the server side before displaying a report, call the class method %GetComponentById(id) to retrieve a pointer to the %ZEN.Report.Display.p object. Then you can access the content property of this object to change it as needed. The <pagebreak> element inserts a page break in PDF output. It inserts a dashed line in the XHTML report on screen, and causes a page break when you print the XHTML report. The <pagebreak> element supports the attributes listed in the following table. The <small-multiple> element lets you output data from a <group> in a series of graphics repeated on the page. Small multiples are useful for tasks such as generating mailing labels. Zen reports takes data from a <group>, formats it in the <small-multiple> element, and then populates a <table> with the repeated elements. To define a small multiple, first define a <group> that contains the data that fills each of the <small-multiple> elements. The attribute small-multiple specifies whether the data in this group is output as small multiples. The default value is "false". The attribute small-multiple-name specifies the name of the small multiple associated with this group. The default value is "small-multiple". Note that each small multiple in a report must have a unique name. The name attribute has the same value as the small-multiple-name in the <group> that gathers data for this small multiple. The <small-multiple> element supports the attributes listed in the following table. The number of rows in the table that holds the small multiple. The number of columns in the table that holds the small multiple. The table CSS class or attribute-set. The row CSS class or attribute-set. The column CSS class or attribute set. The name of the small multiple. The default is small-multiple. Each small multiple in a report must have a unique name. Used to define how the small multiple is filled by the temporary tree defined by the group which is a collection of zr:small-multiple XML elements. horizontal means that as elements are encountered, they fill a small multiple across rows before moving down columns. vertical means the first column on the small multiple should be filled before moving on to the next. The default is horizontal. Because small multiple generation uses temporary trees, you must set the parameter XSLTVERSION = 2.0 for both HTML and PDF output, to ensure processing with XSLT version 2.0. You must not use the class parameter XSLTMODE or the URI parameter $XSLT to direct XSLT processing to the browser. By default, XSLT processing takes place on the server. The data in the group is stored in a variable whose name is small-multiple-name. The <table> element outputs a table into the report. <table> has the following attributes. In Zen report tables, using percentage values to specify proportional column widths works only for PDF output. Percentages do not work as width specifications for tables in Zen report XHTML output. Every cell the table renders uses td for its style class, except for header cells, which use th. Possible align values are "left," "right," and "center". 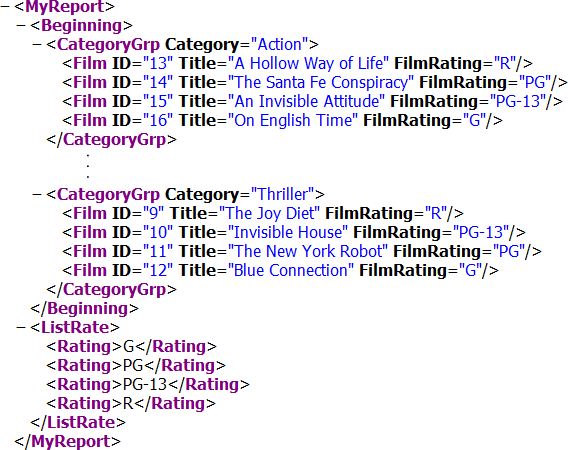 For HTML output, the align attribute aligns the table within the report. CSS color value that specifies the background color of the alternate rows (2, 4, 6, etc.). This is only possible when orient is "col" and group is specified. Overrides the color set report-wide with TABLEALTCOLOR. (Optional) Caption text for this table. data-type The data-type attribute specifies the data-type for the data in the sort column specified by orderby. Possible values are: text, number, and qname. defaultWidth HTML length value for the default width of the table, or the value "none" which means no column width value are generated. For further control over sheet name generation, you can override the method %getDisplayUniqueExcelSheetName, defined in %ZEN.Report.reportPage. If no group is specified for a <table>, the table is based on a single row of data, so there is only one row or column in the table. Since you want multiple rows and columns in most tables, it makes sense to always specify a group attribute for each <table>. Within the table you must provide one or more elements such as an <item> to identify which data from the group needs to be displayed in the table. At first glance, it appears that the rule is that the group value for a <table> in XData ReportDisplay must match the name value for a high-level <group> or <report> defined in XData ReportDefinition. Many times this is superficially true. However, this convention is more interesting than it seems. The value of the group attribute is a partial XPath expression that continues the implicit XPath expression that began with the containing <report> or <group> for the <table>. That is, group and field expressions concatenate downwards from other group and field expressions that are specified above them in the hierarchy of the <report>. Knowing this allows you to use groups and tables in more interesting ways. Possible layout values are "auto" "fixed" and "none". For PDF output, the XEP rendering tool supports both "auto" and "fixed" formats. FOP supports "fixed" only. "none" means to suppress output of any table layout attribute value to the generated stylesheet. If orient is "col," then each child of the table class should have a width attribute specified. If orient is "row", then only one child of the table needs to have its widths specified. However, if that element within the table has a <caption> or <summary> child element to define a header column or footer column, these elements must also specify their widths. A string that identifies which columns to use to sort the <table>. It consists of a comma-separated list of elements or attributes in the XML that provides data to the <table>. If the first character in the orderby string is a ! (exclamation point) then Zen reports interpret the remainder of the string as an ObjectScript expression that provides the string. For further details, see The orderby Attribute in ReportDisplay following this table. For information on using orderby in the ReportDefinition section of a report, see The orderby Attribute in ReportDefinition in the chapter Gathering Zen Report Data. orient Each element contained within the table is treated as either a row or column, depending on the value of the orient attribute. If orient is "row," each child element of table is placed in a new row. Similarly, if orient is "col" each child element is placed in a new column. Possible values are "row" and "col". The default is "col". Not specified, the <table> inherits the removeEmpty value of its parent. If no element in the ancestry of this <table> specifies a removeEmpty value, then the default value, 0, applies to this <table>. 0, empty element and attribute values are output to the XHTML or PDF generated for this <table> in the report. 1, empty element and attribute values are not output to the XHTML or PDF generated for this <table> in the report. If orient is "row," any rows with all empty data values are omitted from the output. If orient is "col," any columns with all empty data values are omitted from the output. If there are some empty cells, but the entire row (or column) is not empty, then the row (or column) is displayed with the empty cells blank. The group attribute must be set for removeEmpty to work. The <table> rowAcrossPages attribute controls whether table rows with multiple lines of content can be split over a page break. The default value true allows the row to be broken, and the value false forces the row to the next page if it would otherwise be split by the page break. For additional information see the section Creating an Object Instance in the book Using Caché SQL. Like orderby in the ReportDefinition block, the orderby attribute provides a comma-separated list of fields that specify how to order items in the <table>. It overrides any ordering already present in the generated XML that provides data to the table. For information on using orderby in the ReportDefinition section of a report, see The orderby Attribute in ReportDefinition in the chapter Gathering Zen Report Data. Each item in the orderby list is an XPath that specifies an attribute or element in the generated XML. You can also specify sorting in ascending or descending order. To do this, add a \ (backslash) and the string ASC or DESC to the XPath in the orderby list. The default sort is in ascending order. The ASC or DESC string is not case-sensitive. You can also specify the data type of the field to be sorted as either number or text. The default data type for sorting is text. To do this, add an additional \ (backslash) and the string number or text to the XPath in the orderby list. The following example provides a literal value for orderby. In this example, the table uses the field number to sort items in descending order as numeric data. The following example centers a 4inch table on an 8.5inch page with 1.25inch left and right margins. The start-indent property of the <div> style attribute uses the <table> width (4 inches) and the available page width (6 inches) to position the table on the page. Because start-indent is inherited, you must set it to 0 on each <item> in the table. When placed inside tables, display elements support the following attributes in addition to their regular attributes. The foblock attribute is ignored for XHTML output. For a simpler option, see truncate or too-long-text. Tells an item in a cross tab table how many columns it should fill. colcount may be a literal number, or it may be calculated from the input. Identifies the group that provides the values for this cross tab table item. The grouppath attribute is required on each item that you place inside a cross tab table with multiple columns or rows. It is not required if the cross tab table has only one column or row, and other types of tables ignore it. (For PDF output only) When there is a long string of data, XEP compresses the data to fit the allotted space. FOP overflows the data into the following space, such as the next table column, printing over what is meant to be in that space. A value of true means the entry is in a block and uses the format identified by block-container-property. A value of false means Zen applies no special formatting to the entry. none" (the default)  Neither wraping nor truncation happens. The behavior is specific to the rendering engine, FOP or XEP. FOP allows the text to run into the next table cell or cells. XEP attempts to condense the text to make it fit, which may cause the text to become illegible. unset"  Allows the current element to inherit the value from its parent. (For PDF output only) If truncate is true, any overflow text is truncated (hidden from view). This is the simple answer to issues with FOP rendering. It is not necessary to set any other attributes if you want simple truncation. truncation-height (For PDF output only) Specifies a truncation height to use if truncate is true or if too-long-text is set to truncate". The default is the height of the column that contains the text. truncation-width (For PDF output only) Specifies a truncation width to use if truncate is true or if too-long-text is set to truncate". The default is the width of the column that contains the text. For details about class, see the Report Display Attributes section at the beginning of this chapter. To include a caption for a row or column of the table, an element within a table can contain a <caption> element. The <caption> element works just like <item>, and has the same attributes. For attribute details, see the <item> section. To use a <caption> to provide a header for a column in a table, place a <caption> element inside the <item> element for that column. <caption> must be the child of the element for which it provides a header. The header text comes from the value inside the <caption> element. Also see <summary>. When you have nested tables, it is possible for the inner table to have <caption> element within it, but that does not mean the <caption> is something for that table to display. It actually refers to giving the inner table a caption within the outer table. If you specify the caption attribute for an <item>, and do not specify a <caption> element, <table> uses the caption attribute as a column or row header for the <item>. If you set the displayCaption attribute to true, the <item> also prefixes the text of the caption attribute to its output. If you supply both a caption attribute and a <caption> element for an <item>, the table uses the <caption> element as a column or row header. If the displayCaption attribute is true, the <item> also prefixes the text of the caption attribute to its output, which lets you specify different text for the header and the prefix. If displayCaption is false, the content of the caption attribute is ignored. You must use an XPath such as "Person/@Column1" in order to use the value of Column1 as caption, as illustrated in the following code sample. The <summary> element is similar to <caption>, except that it creates a footer for the row or column, instead of a header. The <summary> element has the same attributes as <item>. For attribute details, see the <item> section. For older Zen reports, the section When <table> oldSummary is True describes the original syntax for <summary>. Adding oldSummary="true" to your <table> definition ensures that Zen follows these conventions, but this is not necessary since the default for oldSummary is true. Consider the following sample <table>. This example displays a summary at the bottom of each column in the table. Notice that all five <summary> elements for this table appear inside the last <item> element in the <table> definition. Zen looks for <summary> elements inside <item> elements in the <table> from top to bottom. As it finds them, it assigns the contents of those <summary> elements as footer text for the output table columns, from left to right. The first <summary> goes in the first column, the second <summary> in the second column, and so on. That is the reason for the blank value attributes in the first several <summary> elements in the example: These footers apply color formatting, but contain no text. Only the last <summary> produces text, by using the field attribute to reference a value in the XML data produced by XData ReportDefinition. <table orient="col" group="record" width="6in" class="table4"
To support complex headers that can exceed one line and span multiple rows or multiple columns, Zen reports provide the following elements, which can appear inside the <table> container. These elements produce output similar to HTML elements of the same name, but do so equally well for XHTML or PDF output formats. If a Zen report <table> uses these elements it must not use <caption> or <summary> elements, as these definitions conflict. <table group="SaleRep" orient="col" width="6in" class="table4"
When both header and footer are defined, the <tfoot> container must appear immediately after the <thead> container, before any <item> elements that provide the body of the <table>. The following is a more complex example showing a two-line header, plus a footer as well. Note the use of colspan in the <td> and <th> definitions. <td> and <th> support colspan and rowspan attributes. Each attribute accepts a number as a value and causes the content of its parent <td> or <th> to span that number of columns or rows in the header or footer. Each produces output similar to the HTML attributes of the same name, but do so equally well for XHTML or PDF output formats. You can place a <table> within a <table> in XData ReportDisplay. These are called embedded tables. Simply use a <table> element where you might normally use something like <item> inside the table. Look for examples in the next section, Creating Type 1 Cross Tab Tables. You do not need to be working on a cross tab table to embed tables. You can embed tables anywhere your display layout requires it. A cross tab table is one that displays a horizontal header and also uses the leftmost column as a vertical header. At the junction of each pair of headers, the table displays data related to both headers. Some sources call a cross tab table a pivot table; other sources distinguish between cross tab and pivot tables by stating that, while they are similar, a cross tab table contains only aggregated data, whereas a pivot table may also contain data that is not aggregated. It is also possible to distinguish between tables that aggregate by row and those that aggregate by column. This book refers to all such tables as cross tab tables. Zen reports implements two approaches to cross tab tables, identified as type 1 cross tab tables and type 2 cross tab tables. Type 1 tables were the first type of cross tab table implemented by Zen reports, and continue to be supported. Type 2 cross tab tables are recommended for new development, because it is easier to manage their layout, and they provide a more general solution to the problem of creating cross tab tables. An XPath expression that locates data for a cross tab table in the context established by the crosstabRowGroup. crosstabFooterDataField An XPath expression that locates data to put in the cross tab table footer cells. This expression is evaluated in the context of the crosstabFooterGroup. If not specified, the table uses values from crosstabFooterGroup . If non-null, specifies how footer data is formatted. crosstabFooterGroup An XPath expression that provides the context for evaluating crosstabFooterDataField. If crosstabFooterDataField is not specified, crosstabFooterGroup locates data to put in the cross tab table footer cells. 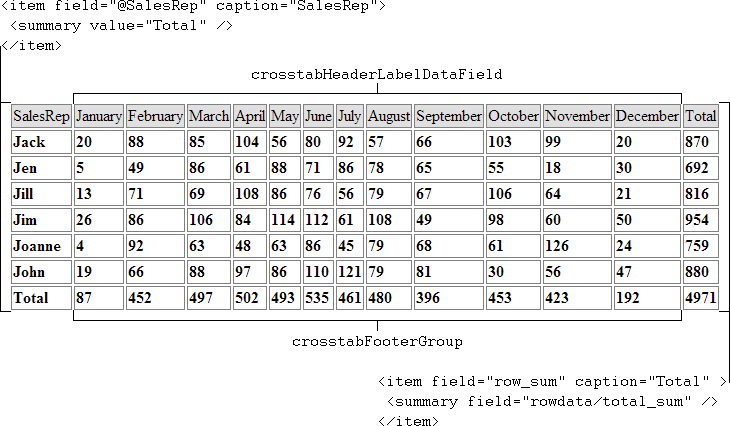 crosstabHeaderDataField An XPath expression that locates data to put in the cross tab table header cells. This expression is evaluated in the context of the crosstabHeaderGroup. If not specified, the table uses values from crosstabHeaderGroup. crosstabHeaderGroup An XPath expression that provides the context for evaluating crosstabHeaderDataField. If crosstabHeaderDataField is not specified, crosstabHeaderGroup locates data to put in the cross tab table header cells. crosstabHeaderGroupLabels An XPath expression that provides the context for evaluating crosstabHeaderLabelDataField. If crosstabHeaderLabelDataField is not specified, crosstabHeaderGroupLabels locates values to use as labels in the cross tab table header cells. none" (the default)  Neither wrapping nor truncation happens. The behavior is specific to the rendering engine, FOP or XEP. FOP allows the text to run into the next table cell or cells. XEP attempts to condense the text to make it fit, which may cause the text to become illegible. truncate"  The text is truncated, and truncation-width is used if present. wrap  Zero length characters are inserted after every character in the text but the last, so the rendering engine allows the text to wrap. crosstabHeaderLabelDataField An XPath expression that locates values to use as labels in the cross tab table header cells. This expression is evaluated in the context of the crosstabHeaderGroupLabels. If not specified, the table uses values from crosstabHeaderGroupLabels. An XPath expression that locates row data. Provides the context for evaluating the crosstabDataGroup. Each of these attributes provides an XPath expression which locates data in the generated XML for the report. The crosstabHeaderGroup provides values for column headers in the table. The crosstabRowGroup provides rows in the table. <!-- The crosstabRowGroup uses the variable "$prevmatch"
This illustration shows output for only one film category. The full report generates a similar table for each category. creates the column of film titles at the left side of the table. The second item uses specialized attributes to generate column headers and put values in cells of the table. 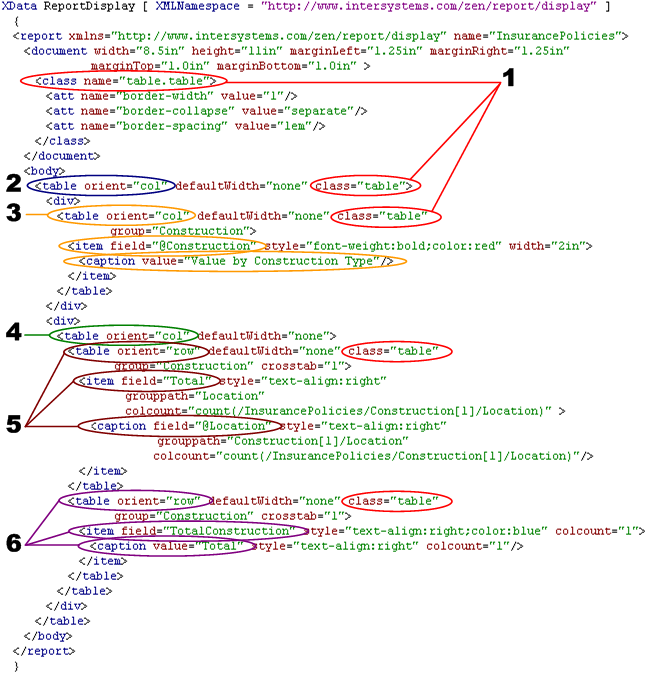 The following illustration shows how the attributes in the cross tab <item> element reference nodes in the generated XML. Note that crosstabRowGroup and crosstabHeaderGroup require absolute location paths. The use of absolute paths means that you cannot rely on context created by an enclosing group. This report uses the special variable $prevmatch to keep track of which category the report is processing. The variable $prevmatch contains the position of the node in the parent group which matched when the report began to fill in the table data. Additional variables are available to handle deeper levels of nesting. These variables are named $level0, $level1, $level2, and so forth, to the deepest level of nesting used in the report. The example ReportDisplay section given previously works equally well with $level1 as with $prevmatch. The crosstabDataGroup selects the specific data node to process, and the crosstabHeaderMatchField specifies which field in the data node the report uses to determine whether the current node matches one of the columns specified by the crosstabHeaderGroup. The following illustration shows how a match between a value in the crosstabHeaderGroup and the crosstabHeaderMatchField puts a value in the appropriate table cell. In this case, the value is the letter ‘X’, which is provided as the value for the field in the <item>. You could also use an XPath expression, such as @Title, that selects data from an element or attribute. 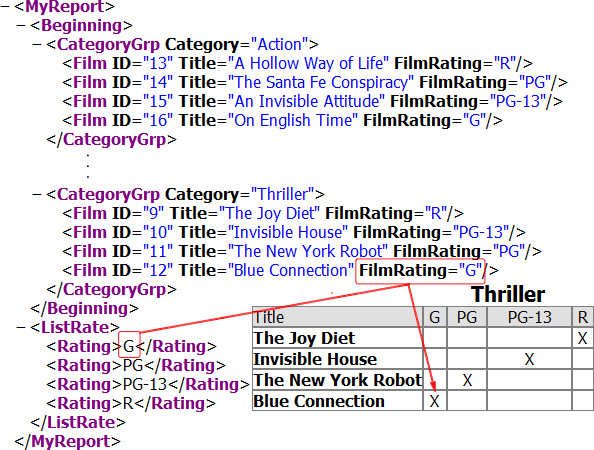 Within the cross tab table, the field attribute is interpreted with respect to the crosstabDataGroup of the <item>, rather than in the context of the <table>. The attribute crosstabHeaderGroupLabels is redundant in this example. If it is not specified, the report uses the value of crosstabHeaderGroup, which is the same in this case. 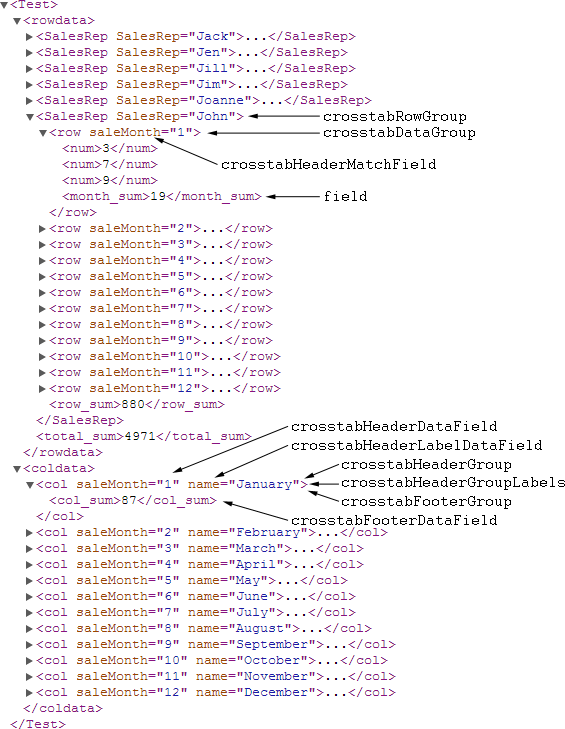 The existence of crosstabHeaderGroupLabels lets use a different location in the XML for the header labels. The following illustration shows the XML generated by the ReportDefinition block. It also shows which attributes of the item in the ReportDisplay refer to which data in the XML. Notice that the crosstabDataGroup and the crosstabHeaderMatchField are evaluated in terms of the crosstabRowGroup. In this example, crosstabHeaderGroup, crosstabHeaderGroupLabels, and crosstabFooterGroup all point to the same node in the XML: "/Test/coldata/col". In a report with a different data structure, these three attributes could have different values, which provides the potential for greater flexibility in constructing cross tab tables. The next illustration shows how the data referenced by the item attributes appears in the resulting cross tab table. The crosstabHeaderLabelDataField is used to replace the numeric sale month provided by the crosstabHeaderDataField with the name of the month. The crosstabFooterGroup provides the row of column sums that appears at the bottom of the table. The property field functions here much as it did in the previous example. It provides the values for each cell at the intersection of sales person and month, as determined by crosstabHeaderMatchField. This illustration also shows the additional <item> and <summary> elements that supply the row headers and row totals. In both cases, the item property caption provides the header for the column, and the <summary> element provides the footer value. Note that $prevmatch is not always updated correctly if XSLTVERSION = 1.0, which can result in incorrect output, especially in cross tab tables that use footers. To avoid this problem, set XSLTVERSION = 2.0. This section discusses the first type of cross tab table implemented by Zen reports. Location  Are the surroundings rural or urban? InsuredValue  What is the amount of money for which this building is insured? Construction  What is the construction type: fire resistant, frame, masonry, or metal-clad? BusType  What is the purpose of the structure: Hospitality, Office, Farming, Apartment, etc. Flood  Is the building in a designated flood zone: yes or no? A line item table to report on this data might look like the following example. The example shows five entries. This report does not process or aggregate values in any way; it pulls each value straight from the database. Our portfolio might includes hundreds or thousands of such entries. It is difficult for us to efficiently assess the state of our business based on such a table. It simply contains too much data to scan. Also, depending on what we want to learn about our business, it contains many fields that do not matter to our analysis. Retrieves the three relevant fields from the database (Construction, Location, and InsuredValue). Groups all values by Construction. Records the Construction type (Fire Resist, Frame, Masonry, or Metal Clad). Groups Construction values by Location. Records the Location type (Rural or Urban). 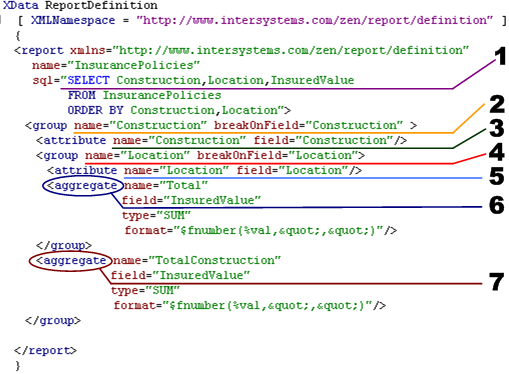 Generates the values to place in the Rural and Urban columns by summing the InsuredValue for each combination of Construction type and Location type. These values are stored in an aggregate called Total in each Location group. Generates the value to place in the output column called Total by summing the InsuredValue for each Construction type regardless of Location. This value is stored in the aggregate called TotalConstruction in each Construction group. Define a style to apply to each <table> within the embedded table definition. This style (table.table) is borderless so that the five embedded tables that structure the display looks like a single table in the output. Define the top level <table> container with column orientation. To create the second column in the top level <table>, define a <div> that contains a <table> container with column orientation. This <table> contains two <table> elements, each of which defines a table with row orientation. The output from this part of the definition consists of two columns, each of which may contain some columns and rows. For the first column in the <table> from step 4, define a <table> with row orientation and crosstab set to 1. The entries in this table come from values of the Total aggregate in the Location group. grouppath identifies the group that provides the values for this cross tab table item. The grouppath attribute is required on each item that you place inside a cross tab table with multiple columns or rows. It is not required if the cross tab table has only one column or row. Other types of tables ignore the grouppath attribute. The purpose of grouppath is to enable a cross tab table to properly label and count its columns based on the input. colcount tells an item in a cross tab table how many columns it should fill. colcount may be a literal number, or it may be calculated from the input. The colcount attribute is required on each item that you place inside a cross tab table. Other types of tables ignore colcount. For the second column in the <table> from step 4, define a <table> with row orientation and crosstab set to 1. The entries in this table come from values of the TotalConstruction aggregate in the Construction group. As is required for cross tab tables with multiple columns or rows, the <item> and <caption> elements in this <table> each specify a colcount value. Since there is only one column, this value is 1. Accepts your specification of which fields you wish to aggregate from your data source. Generates Zen report classes that contain cross tab or pivot tables based on your data. The pivot table generator outputs Zen report classes that use the cross tab table syntax described in the previous section. By generating the syntax instead of typing it into the class directly, you can focus on the data rather than how it looks on the page. This saves time and allows you generate more complex and interesting reports that can potentially offer a deeper analysis of your data. Changes to the namespace where it creates new classes. Creates a new %ZEN.Report.pivotTableGenerator instance and sets some basic properties. For a full list of properties see the table following this example. Creates a new %ZEN.Report.aggregate object and sets some properties, including a type of COUNT. The <aggregate> section describes all the properties you can set. Inserts the new COUNT aggregate into the aggs collection for the %ZEN.Report.pivotTableGenerator instance. Creates a new %ZEN.Report.aggregate object and sets some properties, including a type of SUM. The <aggregate> section describes all the properties you can set. Inserts the new SUM aggregate into the aggs collection for the %ZEN.Report.pivotTableGenerator instance. Finishes defining the %ZEN.Report.pivotTableGenerator instance by providing values for the className and classNameForTotals properties. Invokes the genZenReport() method to generate and compile the new classes. These classes now exist in the namespace from step 1. Invokes KILL to remove local variables created by this command session. Once you have generated the class, you may edit it in Studio to fine-tune the details. %ZEN.Report.pivotTableGenerator has the following properties. Describes an operation that should be performed on the value identified by the value property. Has the properties described in the <aggregate> section. className Full package and class name of the Zen report class to generate. classNameForTotals Full package and class name of a supplementary class that provides some of the aggregated values for the report. The generated Zen report class references the supplementary class using <get>. cols In the output pivot table, columns are numbered from left to right starting at 1. The cols attribute provides a comma-separated list of strings to use as column labels in columns 2 and higher in the output table. group Field by which to group the entries in the generated XML data for the report. reportName Value to use for the <report> name attribute in the generated Zen report class identified by className. rows In the output pivot table, columns are numbered from left to right starting at 1. The rows attribute provides a comma-separated list of strings to use as row labels in column 1 of the output table. table Data source for the report. Creates a new %ZEN.Report.pivotTableGenerator instance and sets some basic properties. For a full list of properties see the previous table. Creates a new %ZEN.Report.aggregate object and sets some properties. It identifies a type of CUSTOM and uses the class property to identify the class that computes the aggregate. The <aggregate> section describes all the properties you can set. Inserts the new CUSTOM aggregate into the aggs collection for the %ZEN.Report.pivotTableGenerator instance. The following two figures illustrate the Zen report class generated by the previous sample command sequence. All of this text appears in one Zen report class; each figure indicates any omitted or truncated text with ellipses (...). The first figure shows the top left portion of the class, highlighting the DEFAULTMODE and XSLTMODE parameters and the XData ReportDefinition block. The second figure shows the bottom left portion of the same class, featuring the XData ReportDisplay block. Another technique for supplying data to a table is to use a callback method. The attribute ongetData specifies the name of a method written in ObjectScript or another suitable language and executed on the server. It returns a two dimensional, 0-based array by reference. ongetData is similar to the ongetData attribute which specifies a callback method used by Zen reports charts to supply data. See Providing Data for Zen Report Charts. In addition to the array reference, a second argument is passed to the ongetData callback method. This argument is also passed by reference, and contains parameter values defined by the table. If the method signature does not include the parameters argument, you get an error. The callback method has access to the xmlfile Zen report property, which allows you to use XPATH techniques to populate the data, using the Caché built-in XPATH implementation. Callback tables are helpful if you want to display data as both a table and a chart. Items in a callback table cannot use the fieldName attribute. Instead, they must use the fieldNum attribute. The following code example creates a simple callback table. Note that the ReportDefinition section of the report is a placeholder. Data is generated by the table callback method. /// ReportDefinition is a placeholder. The table can also use the orderBy attribute to sort the results, which is useful when you cannot rewrite the class to provide the desired sorting. The suppressDuplicates attribute is also supported. The sql <table> attribute allows you to populate a table with data from an SQL statement. You cannot use <group> in the table if you are getting data from the sql attribute. The <item> elements in such a table use the fieldnum or the fieldname attribute to identify the data. fieldnum supplies the 1based number of the projection field in the SQL statement. fieldname supplies the name of the field as returned by the SQL statement. sql="SELECT NAME,AGE,FAVORITECOLORS FROM SAMPLE.PERSON WHERE NAME %STARTSWITH ?" The onCreateResultSet <table> attributes allows you to use a callback method to populate a table with data. You cannot use <group> in the table if you are getting data from the onCreateResultSet attribute. The <item> elements in such a table use the fieldnum or the fieldname attribute to identify the data. fieldnum supplies the 1based number of the projection field in the SQL statement. fieldname supplies the name of the field as returned by the SQL statement. set sql = "SELECT Name,Age,FavoriteColors FROM Sample.Person WHERE Name %STARTSWITH ?" The <timeline> element can be used to display a graphic summary of episodes. An episode is a period of time with a start date and an end date. Some episodes are indicated as generated in the data. You can use the attributes episode-type-node-set and generated-type-code to identify generated data. You can graph generated data using a distinctive color, specified by generated-type-color. The <timeline> determines the start and end dates for the timeline from the data. You can use the attributes static-start-date and static-end-date to override the automatic calculation. Note that variables are in XPath format, so you must quote constant strings. You cannot place a <timeline> inside a <table> unless you place it in a <block>, <group>, <container>, or other wrapper element first. You must set the parameter XSLTVERSION = 2.0 for both HTML and PDF output, to ensure processing with XSLT version 2.0. You must not use the class parameter XSLTMODE or the URI parameter $XSLT to direct XSLT processing to the browser. By default, XSLT processing takes place on the server. <timeline> has the following attributes. An XPath expression that provides the background color of the timeline graph. The default background-color is white. A date, indicated by a downward pointing arrow on the timeline if the date falls within the range of the date data. By default, current-date is the date the timeline graph was generated, but you can use this attribute to set an alternate date. The value of this attribute is not an XPath expression, unlike the majority of <timeline> attributes. The XPath expression for end dates. An episode consists of a start date, and end date, and an optional episode type. The node sets for these three types of data are grouped to form episodes based on position in the XML file: the first start date, end date, and episode type encountered define the first episode, and so forth. The XPath expression for episode types. The episode type determines whether an episode is considered a generated episode. An XPath expression that provides a string or integer indicating a generated episode. When Zen reports finds this value in an episode type node, the episode is considered a generated episode, and is charted using the generated-type-color. generated-type-color An XPath expression that provides the color used to draw generated episodes. Generated episodes are those that have the generated-type-code value in the episode type node. The default generated-type-color is gray. interval-height An XPath expression that provides the height of episode ticks and X axis ticks. interval-type An XPath expression that provides the type of interval you are charting on the timeline. The interval type can be year, quarter, month or day. If you do not supply an interval type, it is determined from the data. For year and quarter intervals, on-color and off-color alternate with every other interval. Odd-numbered years and odd numbered quarters (Q1 and Q3) are colored with the on-color. For month intervals, the coloring alternates with every quarter. The result is similar to the coloring pattern for quarter intervals, with odd-numbered quarters colored colored using the on-color. For day intervals, one day per week is colored with the off-color. The alternate colored days are day 7, 14, 21, and 28 of each month, that is, the end of each full week in the month. max-height The maximum height of the episode graph. If the entire data set does not fit in the available space, unseen episodes are indicated with an up-arrow. The value of this attribute is not an XPath expression, unlike the majority of <timeline> attributes. minimum-interval-width An XPath expression that specifies the width of an interval in the timeline, in millimeters (mm). An interval can be a day, a month, a quarter or a year. Constants must be quoted, "'10mm'" for instance. number-of-intervals The number if intervals in the graph. By default, this value is calculated from the data, but you can use this attribute to override that automatic calculation. The value of this attribute is not an XPath expression, unlike the majority of <timeline> attributes. off-color An XPath expression that provides the color of intervals on the X axis when they are "off". The on and off state of intervals groups them visually on the X axis. Which intervals are considered on and which are considered off is determined by the interval-type attribute. The default off-color is white. on-color An XPath expression that provides the color of intervals on the X axis when they are "on". The on and off state of intervals groups them visually on the X axis. Which intervals are considered on and which are considered off is determined by the interval-type attribute. The default on-color is gray. plotting-color An XPath expression that provides the foreground color used to graph episodes that are not generated, see generated-type-color. The default plotting-color is black. The XPath expression for start dates. static-end-date An XPath expression that overrides the automatic calculation of the end date from the data. A right arrow indicates data to right of the static end date. static-start-date An XPath expression that overrides the automatic calculation of the start date from the data. A right arrow indicates data to left of the static start date.